If one trend in conferences is to go broad by utilizing the festival format, another one I see emerging is to design spaces for focused and narrow experiences. The question I’m asking myself is if narrow and small convenings might in fact be a better vehicle for multi perspective experiences than formats that try to achieve that by being broad and big. 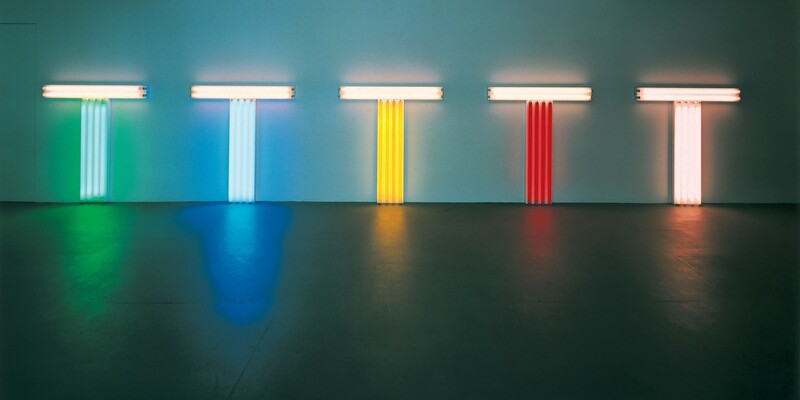 Dan Flavin, Untitled (To Don Judd, Colorist). It all comes down to if you believe that the experience itself is something that happens inside or outside the body of the participant. If the effect of an experience is measured by the looks of it or the emotions it generate. For me it’s clear that a small interaction for a fraction of second can cause an explosion of feelings and thoughts. There is a risk that big scale events with lots of people and happenings on the agenda is actually missing the goal of providing meaningful interactions for the participants. As an organizer and convener it’s easy to find yourself in a situation where you want to develop a fuller experience with more elements for a wider spectrum of human senses. To add things like music, dance, smell, art installations and even surprising routes to the lunch box. I’ve been guilty of putting all of the above “multi sensory stimuli” in action. I’ve loved it, and the feedback have been appreciative. Still I know that it’s in conceptually narrow interactions I get excited, moved and inspired. I need be put in a space that is designed for focus for emotions and intellectual synapsis to happen. Be it with my eyes closed and lying on the floor at a drone music event, alone with a piece of art or in a conversation between four eyes. Another reason why organizers like to think big is because a strive to have impact on as many people as possible. Rightfully so, a lot of energy and time is put into convening people and putting knowledgeable people on stage. But there is an exercise to be made around what part of the endeavor is designed for scale and what is there for depth. I just finished curating Techfestival in Copenhagen. Similar to with The Conference that I did six editions of it’s fantastic to see the energy in a big crowd sharing the same experience. I always calculate in my mind how many minutes people spend. Even if my clock count 60 minutes, the collective time spend in those audiences are 60 000 minutes or 42,5 (!) days. So what if you take all these minutes and distribute them on fewer people and over a longer time period. I’m fascinated and inspired by what the artist Addie Wagenknecht organized at Carnegie Mellon some years back. Instead of gathering a lot of people for a short time, she gathered a small group of people during a longer period of time. During a week fourteen people collectivly spend 141 120 minutes together. They set out to produce new knowledge, individually and as a team. This Deep Lab endeavor resulted in a 240 page book, a short film and ten public talks. Although the number of people meeting in person was small, the time spend was huge. AND the number of persons impacted, and the amount of time spend reading and watching the outcome widely outgrows that of any conference. Posters from Techfestival’s 150 think tank. Another good example of flipping the scale from number of people in the room to number of people impacted by the result of the work in the room is the think tank 150 that took place during Techfestival. 150 persons gathered to during two days create a the Copenhagen Catalogue in which the participants made a poster each with a principle towards a new wave in technology. Small group + sharable result = best of two worlds. Right? If people are willing to invest a lot of minutes of their life, it’s a good sign they are eager to learn and chances increase you will have a good experience together. To me it seems like quantity is the prevailing modus operandi of our time. There’s a notion that in order to get funded you need to aim big, and in order to get continuous funding you need to show growth. It’s obvious to me that we need to question this, not the least in for the sake of qualitative human experiences. Yes, from an event economics perspective it’s much harder to make things go round with a smaller number of participants. But I think that the awareness of that essential qualities that get lost when gatherings grow big is a good cue for rethinking in what format it make sense for events to scale. Personally my favorite format is having six peers around my dining table. To build from that intimate experience of hour long conversations among the same group of people I believe is an interesting track to explore for conveners. Getting to know new humans, understanding where they come from and how your perspectives can shift with them in your life is to me the true meaning of convenings. Thanks to Melina Shannon-Depietro, Björn Jeffery, Kristoffer Tjalve and Matthias Weber for much appreciated feedback and energy.